May the Force be with you! 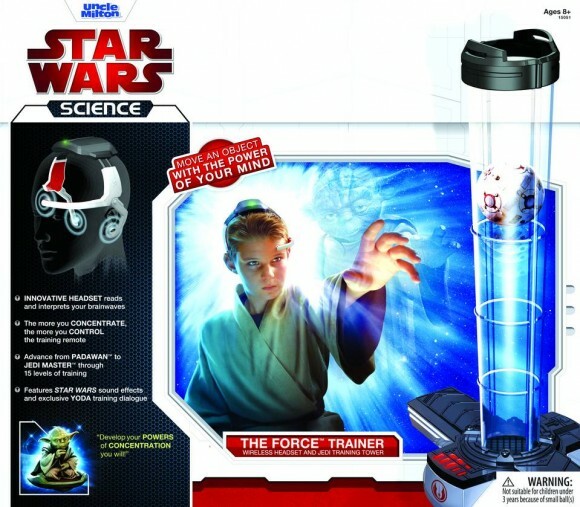 The Force Trainer by Uncle Milton actually allows you to control a Jedi Training Remote with your mind, by tapping into cutting-edge brainwave technology. Utilizing dry neural sensor technology, the headset reads and interprets your brainwaves. The deeper your concentration and mental focus, the greater your ability to move the Training Sphere up or down the Training Tower. I eagerly await the inevitable Force Lightning add-on. That’s funny. I blogged about something similar recently, but it wasn’t a star-wars toy. It was geared towards kids and used to move blue balls with their minds. uhm…this is definitely weird and yes…creepy! I won’t be surprise if the next line off toys will teach kids how to use their Jedi mind tricks on an advance level. That includes the ability to double jump and hypnotize their parents for a minute or two. Lightsabres not included.